William Wordsworth was able to run off with the nature poem because he passionately believed in it — in, as he always said, its psychological truth. But for all its merits as a poetic expression of behaviorism, The Prelude as it progressed represented a shrinking of the experimental base to one subject of observation: Wordsworth himself. The subtitle “Growth of a Poet’s Mind,” indicates Wordsworth’s assumption that he himself was an adequate representative of the growth and supreme achievements of Imagination, and that he was his poetry. A poet’s mind is a great mind. 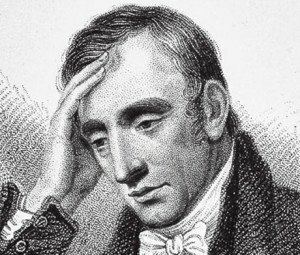 Wordsworth went on in another long poem, The Excursion, to which The Prelude is the prelude, to dozens of other case histories, but as a lot of critics noted, the main such histories seem merely to be versions of Wordsworth himself. So talks as it’s most used to do. The poem connects thematically to Hartley’s attack on the flowers, to transfer of guilt, but is about STC himself and how he deals with Hartley — where the whipping comes from. The connection with “Christabel” is that the poem’s heroine Christabel is at the end of her story (as STC left it) cast off by her own father Sir Leoline, “the Baron rich,” who thinks she has dishonored him by begging him to send away the daughter of his friend (she isn’t really). In other words the verbal whipping, the “rogue,” “varlet” appellations that one might attach to a child in mutually understood joking, were actually serious. It seems that STC made a mistake of wrongly disciplining Hartley, and can neither explain nor admit that mistake. All he can do to assuage the guilt is place it on the shoulders of a fictional character, Sir Leoline. STC attributes the Baron’s mistake to his love for his daughter, but that leads to questions. If the Baron is voicing rage to instill pain in the child so the child can be pitied, which stirs greater love in him, how does this interpretation really fit the story? The Baron is possessed by a spirit, just as the Mariner is. He isn’t doing any emotional calculating. As STC says, it would be a sorrow and shame if his description of the Baron’s action were actually true, if the Baron were conscious of what he was doing. In Hartleian terms, such actions on the part of a parent do not involve joy and could only do harm to the child. It would be an even greater “a sorrow and a shame” if such actions were actually required to prepare a child properly for life’s pain and grief. It would be to admit that real life was the constant that children must be adjusted to, rather than a temporary situation that, as Rousseau had it, educating children properly would slowly improve. It would be to suggest that parents are right to let loose with their emotional responses to their kids, no matter what these responses may be, because this is what the kids will face in real life. The mistake STC made with Hartley probably arose out of opium-induced rage and pain, aggravated by Hartley’s incessant hyperactivity. One neighbor at Stowey described him as “a little chattering inquisitive rogue.” STC himself admitted that he was “something too rough.” Hartley later summed himself up at this age as “a sun-burnt, prattling elf/a froward urchin.” In a letter written just after the move to Keswick, STC says to Southey: “Hartley is a fairy elf, all motion — indefatigable in joy — a spirit of Joy dancing on an Aspen leaf. From morning to night he whirls about, whisks, whirls and eddies, like a blossom on a May breeze.” Hartley always moved like this, even as an adult. The locals joked that he should carry boulders in his pockets just to keep his feet on the ground. Hartley’s words, breeze-like movements and imaginative songs clothe fancies and unutterable thoughts that seem to come from another (a fairy) world, like the “ocean of souls,” the pre-existent world that Wordsworth was to describe a couple of years later in “Ode: Intimations of Immortality.” However, the extremity of Hartley’s precocious freedom seems to worry Wordsworth. Will such a child be able to carry on into adult life when pain and grief assail him? For what might be thy lot in future years. A young lamb’s heart among the full-grown flocks. Ill fitted to sustain unkindly shocks . . . . This poem echoes the fears of STC in “The Foster-Mother’s Tale” about the youth who has to flee to the wilds. Here, though, the outcome is even worse: death. Hartley’s education would have proven a big mistake. Would STC have agreed that one of nature’s “severer interventions” could be death for those who cannot adapt to real life? STC left no record, and may not have been aware of the poem until 1804, when it was transcribed for him to take to Malta. 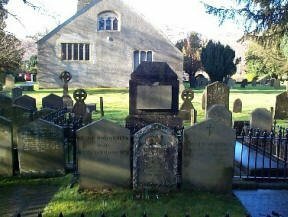 According to Derwent, Wordsworth recalled his poem shortly after Hartley’s death (from complications resulting from bronchitis), when he and Derwent went to the Grasmere graveyard to mark out a spot for Hartley. It seems that the spots of time that had gone on for the first thirty years of Wordsworth’s life were now weakening and abating. Nature hadn’t changed; Wordsworth concluded that she weaned children by engineering a change in them. But why? Especially when the imagination needs constant reinforcement to resist the accumulating pain and grief of adult life? The syntax is hard to figure. Does the power of joy wed nature to us and endow us with new earth and new heaven? Or do we, when we wed nature to ourselves, endow ourselves with joy? The first implies that joy is present from the beginning, maybe pre-existent; the second that we become joyous when we find nature. STC may have wanted it both ways, but later in the poem he says that the “shaping spirit of Imagination” was endowed on him by nature at his birth. By 1802, STC was disenchanted with Locke and David Hartley. He was engaging with Kant. Back in 1799 he’d named his second son after George Berkeley, a famous Platonist or as Berkeley himself put it “Immaterialist.” He believed that esse est percipi — that what we call the physical world exists only when it is perceived. It was Berkeley who moved Kant out of science towards moral philosophy, even though Kant refuted his conclusions. In a Letter of 16 March 1801 STC wrote to Thomas Poole (in the grandiose manner that to Poole indicated opium) that, “I have not only completely extricated the notions of Time, and Space; but have overthrown the doctrine of Association, as taught by Hartley, and with it all the irreligious metaphysics of modern Infidels — especially, the doctrine of Necessity.” By necessity STC meant the scientific, not the religious, version of the conundrum of faith. He’d deduced that science proved that consciousness and conscience could not exist as we think of them — as mental faculties that effect our actions. The vehemence of his rejection of scientific necessity was a result of his ongoing insecurity about nature. STC never had laid claims, as Wordsworth did, to “spots of time” that date back to his pre-school days and that generate “acts of love” in adulthood. For him there were, especially, no “severer ministrations” of nature that reinforced empathy. This violated what he understood of behaviorism. His one recorded early memory, his only “spot of time,” is of running away from home after going into a rage and trying to kill one of his older brothers with a kitchen knife. He spent that night outside, hiding. This was not a joyous experience that could be written up for the Lyrical Ballads, though “Mariner” might contain emotional fallout from it. It implied a will overpowered by emotions like hatred and pride, even at what was supposed to be that ideal state of childhood in a secure and loving family in a rural area. It implied the unconsciousness — the world of the dream poems — had itself to be educated by constant prayer and contrition (psychoanalysis being unavailable at the time). What STC does lay claim to in “Dejection” is an overwhelming youthful joy that lit up experience in childhood and youth, showing the ultimate unity and purpose of experience and so creating hope. His school days in the city did not snuff his joy in life, and that joy was re-charged in early adulthood by “spots of time,” the gentle, joyous kind that he registers in his early conversation poems. This was the joy that STC and Wordsworth saw, and regarded as so important, in Hartley. The “afflictions” STC refers to in “Dejection,” the afflictions that destroy hope, are unspecified but are the two that, as we’ve seen, were laid out in a theoretical context in “The Nightingale,” where nature therapy works on the child Hartley but not always on adults who are disappointed in love or physically ill. Physical illness and heartache were exactly what was bowing STC down when he wrote the first version of “Dejection.” STC was always sick because of his addiction, and Asra refused to return his affection and remained friendly but distant. Hartley’s attachments are excessively strong — so strong, even to places, that he does not like to go into town — or on a visit/ The field, garden and river bank/ his kitchen and darling Friend — they are enough/ and Playfellows are burthensome to him/ excepting me/ because I can understand and sympathize with, his wild Fancies. A few days later, Hartley freaked out at the sight of a madman passing by, chained. STC isn’t sure what to make of the fact that, as he interpreted the situation, fear overcame empathy in Hartley. Shortly after that, STC reported in a letter: “That child is a poet, spite of the Forehead ‘villainous low,’ which his Mother smuggled into his face.” We have to ignore here the gratuitous insult to his wife and the joking reference to phrenology, a “science” that had come out of anatomical studies of the brain, inspired by the discovery that some brain functions were localized. Phrenology claimed to show that the shape of the skull indicated personality; a low forehead indicated a small frontal lobe that indicated a cretinous or insensitive, likely criminal, personality. Behind this was the idea of the localization of brain functions, and behind that atomization of conscious thought and further proof that free will was unlikely. Any Daltonic anatomizing of the mind was threatening to STC. But it is now accepted that localization is a fact — that “intellectual functions” like language, math, and intuition can be mapped on the brain. The main thing for Hartley, though was that STC identified him as (despite his having the wrong physiognomy) a poet, showing overall approval of his progress. STC goes on to note that Hartley and his brother Derwent are not “decently behaved, though they are the general Darlings of the whole town.” At the beginning of January 1803, on one of his visits to London, he writes to Sara remonstrating with her for giving Hartley coffee in the morning, “and this for a child whose nerves are as wakeful as the strings of an Eolian Harp, and as easily put out of tune!” He makes a good point, again sensitive to factors other than scenery that influence thought. A major shift happened in Hartley’s life in 1803, when the Southeys moved north, to visit at first but then (at STC’s invitation) to take up residence in the Keswick house. A mini-Pantisocracy was taking shape, though this was in no way STC’s plan. He saw it as a chance to get away from Sara, to plant his eggs in another man’s nest. It worked out well. Southey was a popular journalist, earning increasingly impressive sums for his book reviews, biographies and popular histories, and even for his poetry. He was generous in paying STC’s share of the rent etc. He added his massive library to Jackson’s and STC’s, making up what was probably the biggest congregation of books in northern England. By the end of Southey’s life (1843) it amounted to 14,000 volumes. Hartley was a major beneficiary of this. Sara greatly admired Southey’s openness and generosity (and there is some evidence that he greatly admired her). Southey took over what STC called “vice-fathership.” He fulfilled the duties of home-schooling STC’s kids, with his own younger ones, averaging out (i.e. counting in the usual deaths) to about six kids. He taught Latin, Greek and Spanish while Sara continued with French and Mathematics. He was a great success with the kids, as Hartley, Derwent and Sara (who had arrived the year before) would always say. For example thirty years later Hartley would report to his sister Sara that he’d seen “uncle” and found him “quite as good, and sometimes as funny and light hearted.” Southey invented games for the kids and adults to play. He produced the first English translation of “Goldilocks and the Three Bears” to read to them. 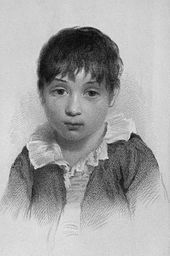 He is thought to be the writer of the children’s poem “What Are Little Boys Made Of?” And Hartley, the oldest kid in the house, enjoyed Southey’s kids as much as he did his own brother and sister. Having seen Southey comfortably set up in Jackson’s house, STC settled his Wedgewood annuity directly on Sara, bought life insurance on himself (he was always fairly confident that he was not long for this world) naming her as beneficiary, and went to Malta. He’d met the Governor, Sir Alexander Ball, who liked him and agreed to take him on as a secretary, and he thought that a hot climate would cure his ailments and reduce the need for opium. Once again he was an absentee father, at a time when he and Wordsworth thought Hartley to be in a critical period of his education. Here now is God, suddenly appearing in Wordsworth’s mature poetry. God is, like the universe, our home, but that home now includes an unremembered, pre-existent state. God is the ocean of souls — souls that are washed up onto the shores of life. Wordsworth was worried that such an image violated Christian orthodoxy and could cause hurt, not to mention trouble for him. So he defended it on both religious and commonsensical grounds, and not just as a “poetic” idea. First, he argues, the idea of a pre-existent state “has entered into the popular creeds of many nations.” Second, “though the idea is not advanced in revelation, there is nothing to contradict it.” Third, if the soul were immortal, it would always have existed. Once the soul arrives in this life, “Earth,” the “homely Nurse,” “with something of a Mother’s mind,” starts to train the child to the virtues expected by “real” life: obedience, endurance, and purposefulness. Note that Wordworth isn’t using “Nature” here, though it seems that by “Earth” he means Nature. He’s trying to avoid saying that Nature is now wrapping the child in the chains of reality. That would go against the message of all his earlier poems. A six years’ Darling of a pygmy size! Some fragment from his dream of human life . . . . The little actor cons another part . . .
David Hartley might’ve said, “At last!” Even though he would’ve objected to the whole concept of imagination. This was the most realistic (Aristotelian) and commonsensical view Wordsworth had yet presented of how a child learns. It may have been based on his hopes for his own son John, about a year old at the time, destined to become a clergyman in Grasmere (Hartley liked his sermons, though he thought his habit of wearing Wellingtons in the pulpit a trifle gauche). It was likely based on a second look at Hartley himself, not so much the joyful dreamer exclusively but also the serious explorer of “real” adult life. And hear the mighty water rolling evermore. Somewhere around this time Wordsworth revised a line (previously quoted) in The Prelude. The “fructive” virtues of his “spots of time,” become “renovative” virtues. The consecration, and the poet’s dream . . . .
Wordsworth thought he’d arrived at a higher wisdom — that his soul had truly been humanized. Others, like Byron and Shelley, came to think he’d been de-humanized, that he’d actually just reached for the nearest comfort and consolation: Christianity (a sort of Buddhistic version). Religion was not for Wordsworth or even STC what it was for William Blake, a constant pulse of joyous revelation. It was a fallback position, a “plan B.” It represented defeat. The old man with the beard now appears regularly and Wordsworth’s later poems about Nature and the lives of rustics turn into epic versions of “Elegy Written in a Country Churchyard,” where the narrator feels “the still, sad music of humanity” second-hand, through subjects that are often dead and buried or close to it, and where the narrator’s awareness of pain and misfortune necessitates (in the sense of a deathbed confession), his awareness of God. On the cool flowery lap of earth . . . .
Again find Wordsworth’s healing power. Hartley, a transition figure between the Romantic and Victorian poets (being slightly younger than Byron and Shelley, a dozen years older than Tennyson), tended to take, as we’ve seen, Arnold’s line.